Folk who work with wood tend to fall into two distinct camps, those who deem themselves hobbyist or amateur and professionals. Having worked in both camps, there are advantages and disadvantages to each. The professional, beavering away at breakneck speed is always up against the clock but sometimes - as I was - in a shop with other makers where ideas can be bounced off one another. On the other hand, the hobbyist - as I am now - works at a far more leisurely pace, making a bit here and there when time and circumstances permit. So you may well ask, "What does this preamble have to do with the topic in hand?" The answer is very simple time. Making a complex piece of furniture is as much an academic exercise as a practical one and time, lots of it, needs to be allocated to work out precisely how the piece is going to be made. The professional though, isn't afforded this luxury, so has to build up a mental catalogue of tricks of the trade to ease him or her through tricky situations in the quickest possible time. The amateur, when faced with the same conundrum can go indoors, put on the kettle for a nice brew, break open a packet of plain chocolate digestives - nothing else will quite do when the grey matter needs to be engaged - and really think through the issue in hand. One such issue is how to hold, cramp or glue awkward shapes. Excellent pieces abound within the hallowed pages of F&C, but in general, those that are flat and rectangular, with everything at 90°, present no real problems with work holding or gluing, with the caveat that normal good practices are adhered to. As soon as curves or rails are introduced, that are joined at angles other than 90° for example, not only does the whole project become visually more interesting, but equally, a lot more difficult to hold or glue. This is where the professional's tricks of the trade or the hobbyist's packet of biscuits becomes important, though they aren't mutually exclusive. I well remember some years ago working in a 'shop where I happened to glance at my then boss, Richard Taylor, who was in the process of cramping up a kidney shaped desk that was eventually destined for David Linley. 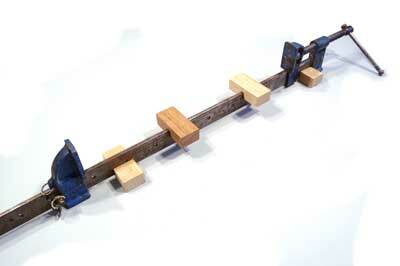 There wasn't a straight line in the piece and it was festooned with every conceivable cramp in the workshop. Clearly Richard had consumed more than one packet of biscuits to work out how to bring it all together. 1. Sash cramps - a decent selection of different lengths including different variations thereof, i.e. pipe cramps. 2. 'F' cramps - a deeper reaching cramp where a selection of sizes is desirable. 3. 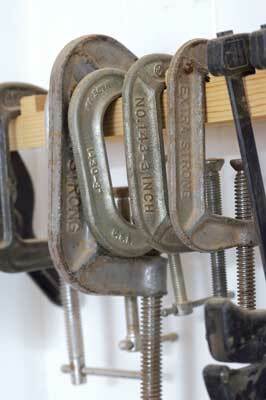 'G' cramps - the old stand-by and available in a range of sizes from 50 to 300mm. These types of cramps will cover 95% of cramping situations. There are some specialist cramps that could be included to cater for this 5%. Perhaps one of the most useful, particularly if a lot of lipping is undertaken on a curved edge, is the Bessey Single Handed Edge Cramp. But at over £50 a pop a very deep breath is needed before the 'purchase' button is clicked because at least a dozen would be needed. Another type of cramp where a selection is very useful is the ubiquitous 'toggle' clamp, again available in different types and invaluable for jig making. Three or four nylon band cramps ought to be included, useful for applying pressure to all types of awkward cramping situations such as chair work. Last but not least, the old fashioned wooden carpenter's hand screws are worth mentioning as being excellent for cramping 'out of square' pieces. Going right back to first principles, pressure is transmitted to the job through the long axis of the cramp. 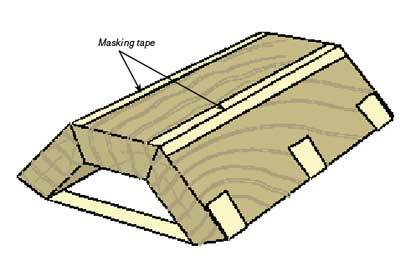 Firstly, it's essential that the cramping block is perpendicular to the face where it's applied in order that no slippage takes place. 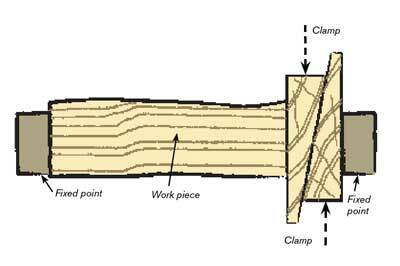 Further, if a sash cramp is used, maximum pressure is applied directly along the axis of the thread. I always use a little block, not only to support the cramp but to raise the job clear of the bar and in line with the thread. Secondly, any force can be broken up into two components. For example, take this magazine, close it, and place your index fingers on the short and long sides, then push at 90° to the edges. The magazine will start to move at 45° away from you, provided that the force used is equal on each edge. Alter the force in each hand and the angle that it moves away will alter accordingly. 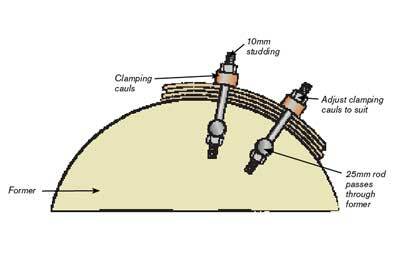 It's this principle that can be used to cramp certain jobs, particularly mitres. When an awkward situation arises, we need to employ some cunning strategies to ensure that the cramping block remains perpendicular to the job. Faced with an awkward cramping situation it's useful to bear in mind some of the basic, mechanical principals, all of which can be used as circumstances dictate. Many of these applications have their commercial equivalent, the only limitation being the depth of your pocket. 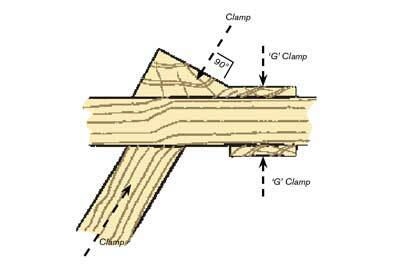 As mentioned earlier, where a rail joins a stile at an angle other than 90°, the face of the sash cramp must be positioned perpendicular to the cramping block. 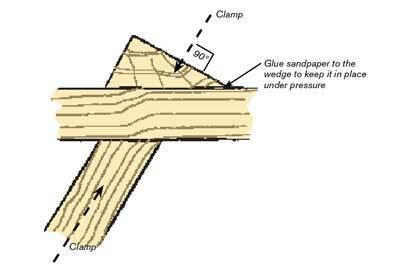 In this case it is a simple wedge, which can be held in place in a number of ways; either friction - using a piece of sandpaper, glue or a 'G' cramp. 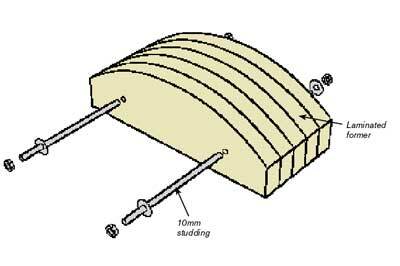 Matching two wedges produces the folding wedge, where a simple rectangle of wood passed through the bandsaw and left rough sawn for added friction, is capable of exerting a considerable pressure. 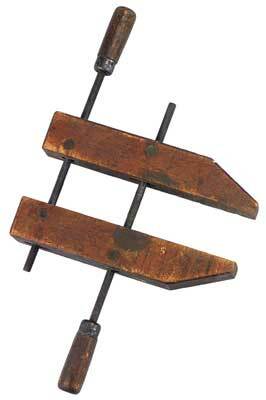 Wrap a wedge round a rod - in simple terms - and a screw thread is produced. As makers we use them all the time in other cramps and pay scant regard to the principles of how they work, but a simple and cheap way of cramping large, solid laminated blocks - as used to press concave or convex shapes - is to join them together with lengths of 10mm studding, something I remember Richard Taylor doing when he was making the kidney desk. They can also be used in other laminating applications instead of a multitude of 'G' or 'F' cramps as can be seen in F&C 78 from 2003. 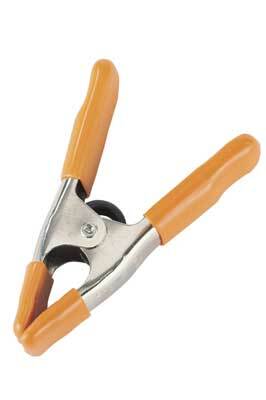 Cams can be used in the same way as folding wedges and for much the same sort of applications. 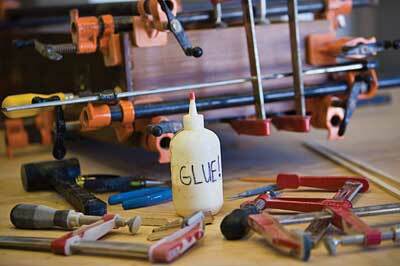 Made from a good quality birch ply, they can be used for cramping more delicate assemblies on a baseboard. No self-respecting workshop should ever be without a copious supply of decent quality crepe masking tape. 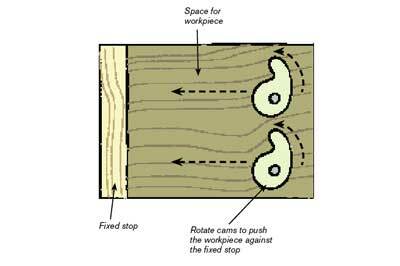 The slight stretching qualities can be used in applications such as joining veneers - a favourite technique of Robert Ingham - or to pull coopered staves together when perhaps making a curved door. Mention should also be made of the humble rubber band, a quantity of which ought to be lurking in a quiet corner of the shop. Some time ago, my wife accidentally broke a very expensive scarab beetle souvenir - and yes, they do exist - brought back from a holiday in Egypt. It was impossible to hold it in any way other than to wrap it tightly with a long length of 12mm rubber band until the glue had set. If a longer length is needed then a bicycle inner tube can be sliced lengthways as required. 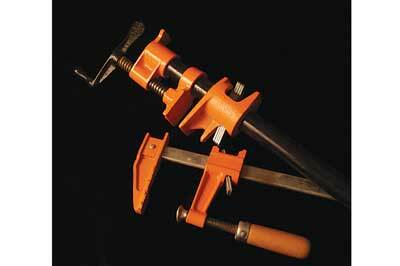 A technique with a somewhat fearsome reputation in medical circles but one nonetheless that has applications in the workshop, particularly for mitred assemblies, though the technique can be adapted for other shapes such as octagons. 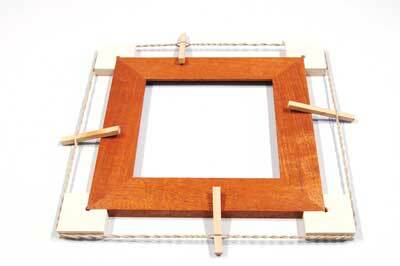 Although there are many commercial mitre cramps on the market, for years I used four 'L' shaped blocks of birch ply, a length of good quality brown hemp twine and four dowels or sticks to glue together picture frames. This seems like it might be one of the simplest things to make, but is also one of the hardest to do accurately. It's worthwhile remembering to rub the sticks with a little candle wax as after several turns it becomes almost impossible to move them against the hemp twine. Also a cord with little or no stretch is desirable. Nylon cord is a little self-defeating. There's no question that holding difficult or awkward pieces can cause problems, particularly if it's a situation that we haven't encountered. Some head scratching and consumption of coffee and biscuits may be required, but provided time is taken to think through the problem, a solution can generally be found. The opposite side of the coin is to charge headlong at the job without thinking, which has personally resulted in me feeding an entire job through the bandsaw, to my cost and ultimate embarrassment.